DNAOS provides open and standards-based solutions and an integration platform for secure virtual profile and collaboration portal. 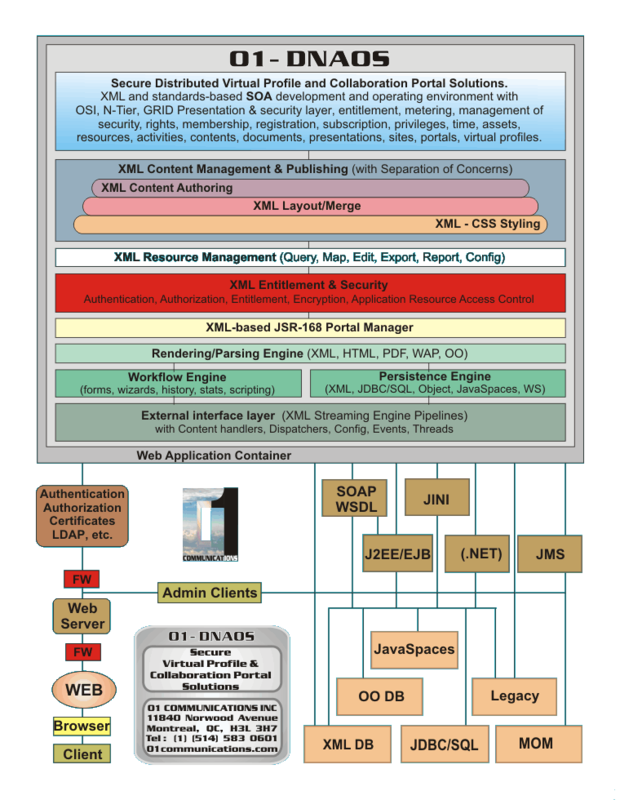 In a SOA (Service Oriented Architecture), DNAOS provide a rich set of development, deployment, operation, maintenance, modeling, and management tools and services for virtual profile applications and collaboration portals, with support for multiple and/or compound organizations. DNAOS are based on secure management of virtual profiles and distributed resources. DNAOS secure distributed resource management services are designed for virtual profile applications where profiles are assembled as needed, from any combination of distributed resources, and made available as required and authorized, so that users can access profile data as an integrated component but only for the information segments that they are entitled to, according to security configurations. Standards-based DNAOS integrate with most existing authentication, authorization, and encryption solutions adding unlimited granularity security configuration to secure distributed application resources and virtual profiles. DNAOS also provide tools to model and manage the security configurations, in production, while also off-loading data security management from the business logic application servers and freeing applications from security configuration dependencies, saving maintenance time, effort, and money, as well extending distributed application life cycle. Support for authentication, authorization, and encryption. Revenue accounting and invoicing, with time and materials. For more information, on DNAOS and related technologies and issues, or on migrating from previous or other solutions, please visit the links on this page's menu, as well as other pages on this site, or send us a note.